A couple of years out of University most young ladies are occupied with thoughts of good jobs, more studies, the latest fashions, relationships and the best hang outs. Esther Kalenzi is no different except for one other thing; her compulsion to make a difference in the lives of orphaned children. Last Lent season, drawing on her desire to do more and her inherent love of children, an idea was born to Esther. She would contact as many of her friends as she could manage, and request them to donate all that they could. Whatever she received she had meant to send to orphanages and pediatric wards during the Easter weekend. It was a big dream she says, but it was also perfect timing. Seasons such as these evoked the spirit of giving in most. When Esther set up the Facebook group called Forty Days over forty smiles on February 27th, she had no idea as to the sort of revolution she had started among people her age. These are young people, barely into their first jobs with so little to give and yet so much, as she was yet to realize. The Facebook page Forty Days over Forty Smiles took a turn of its own. She had invited her friends, who’d invited their friends and those had also invited their own friends. She did not know everybody, but she figured, the more the merrier. On the page Esther had asked whoever had anything to spare from money, to clothes and books to bring them forward. After doing a little research and asking around, she got to visit two orphanages “Make the Children Smile” and God’s Grace Orphanage. By the time Easter came along, Esther along with her friends had managed to raise 3.1 million Uganda shillings (most of which trickled in the last 10 days). The money was used to buy much-needed food, books and other utilities. Whatever else was donated (sacks of clothes and shoes) in addition to the money was split between the two orphanages. It was a happy Easter for the children but it was also clear that God’s Grace Orphanage of Kyebando was going to need more help. Sporadic donations were all they had depended on in the past unlike the other which had a Church Cell dedicated to it. The forty days had come and gone but the needs of the children had remained and so had Esther’s compulsion. “The children had real needs…and now they had my number, I could not ignore them”, she says. The Facebook page stayed open. Monthly breakfasts with the children were set up to all who could be present. “We wanted to give them a touch of the outside world; of family”. The breakfasts were good but they would not solve the problems that occurred in the interim and it’s for this reason that the charity bazaar idea came up. The response to Esther’s request for donations for a fundraising bazaar was overwhelming; greater than she had expected. There are days when she ended up keeping the sacks of clothes under her desk at work and having to borrow her mother’s car to ferry the things back home in preparation for August 4th. Friends helped and the owner of a bakery near her workplace allowed her to use the premises as a drop-off. Mobile money became important too. Strangers approached her and trusted her to deliver whatever they donated, she was humbled. 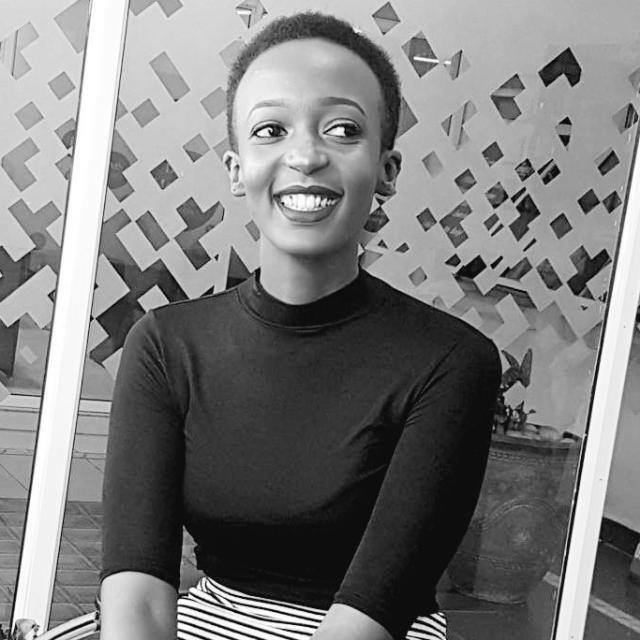 Esther and her team were able to raise a little over 5 million in a day selling secondhand clothes and renting out tables after managing to acquire rent free space at Lugogo. At the thought that it has been a year since the project started, Esther smiles, “It feels like yesterday”. The children have grown in number from 70 to 118. They are not all orphans. Some children are sent there by parents who cannot take care of them but the host, Mariah Kiwumulo never turns anyone down. Esther is not in position to either because before her team came along, Mariah was managing just fine. These days when my phone rings, I worry…it could be anything from a chicken pox outbreak to the flu. There are days when I will openly guilt trip my friends into donating at least five thousand shillings so I can take a child to hospital from Kyebando. Most days we have wonderful volunteers other days are not so easy, people are busy; understandably so. Beginning of school terms can be overwhelming because the children will need at least 3 million for school fees alone, then there are food and classroom requirements. We are managing the best way we can. It is all about friends of friends and general goodwill…and Facebook. Getting the bigger companies to sponsor their events has been close to impossible, Esther admits. She has not given up though. She understands that it will take a while to get her cause tabled or taken seriously but in the mean time all the fundraising and activities done will keep the children afloat. They will know someone cares, that the movie nights, basket ball games and football screening are all in the hope of making a change, however small. Esther’s compassion for these children is evident from the start of the interview but I ask if it takes a toll on her sometimes. Yes, she admits, it has its frustrating moments as in the case of acquiring sponsors. She is quick to add that anything else would probably be just as frustrating. She has a support system holding the cause together, right from her mother volunteering her car to her friend’s doctor offering to do a free surgery on a little girl with a uterine tumor. She has made many friends since she started the Forty days over forty smiles project. She has also lost some. Sacrifices have had to be made but she doesn’t regret any. At the end of the day she knows that at least one child smiled because of the 40/40 family. What would normally be spent on a night out is now donated to help the children. Mornings that some of her friends would ordinarily spend nursing a hung over are foregone because of prior commitments to events like the monthly breakfasts with the children and the fundraising basketball and football games. Not every one of her friends has been willing to do all of these things but the turn up at the events has always been awe-inspiring. As we conclude the interview, I mention that I have joined the group on Facebook Esther laughs. She says there are people who have left the group in the past because she “spams” their timelines with the latest news about the children, and includes a budget on which money has been spent on what (to the last shilling on salt) and how much more is needed. She wants the people who are too busy to be present but keep donating to know what their generosity is doing. A version of this article was published here and you can find out how you can help here. Next PostNext What ticks you off…?